Corn Salad is a staple of summer cookouts and barbecues. This simple salad features corn on the cob that can be simply cooked in a pot or on the grill. 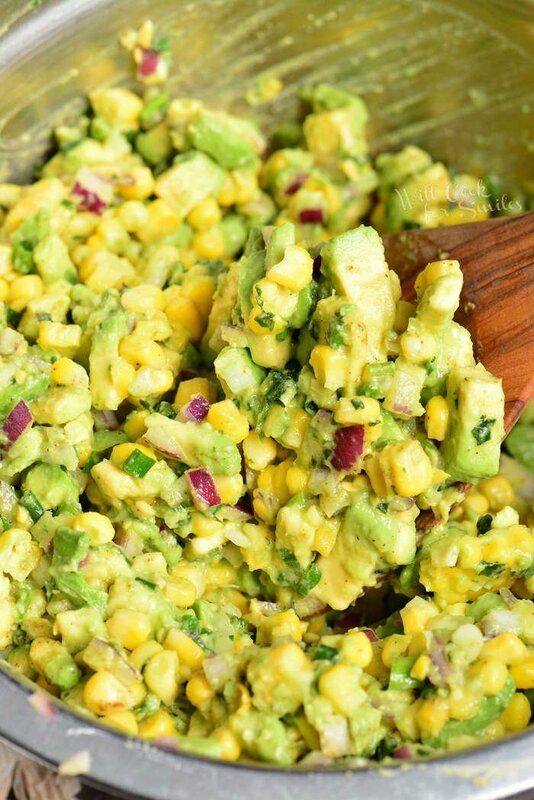 What makes this corn salad extra special is a generous addition of avocado. 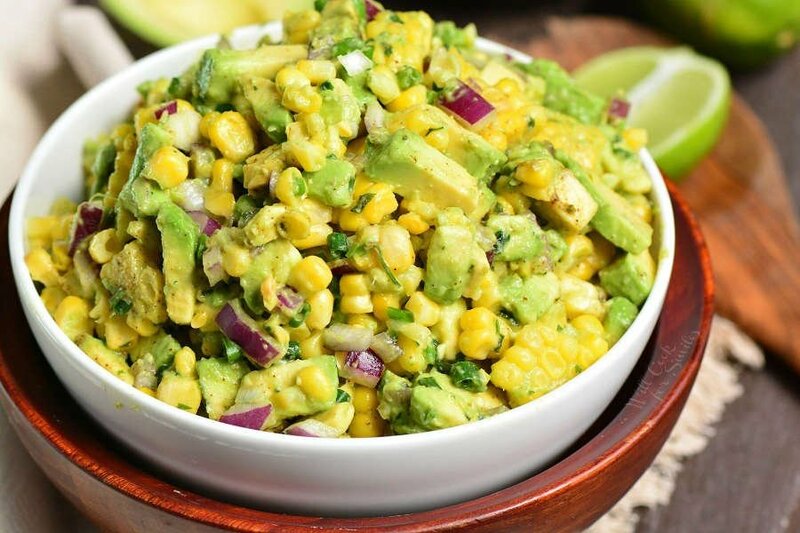 This avocado salad and corn salad fusion is made with simple combination of ingredients and it is so flavorful. Corn salads can be made in many great flavors so make sure to try this Mexican Street Corn Salad as well. This amazing Guacamole recipe is always a must at all my summer gatherings. 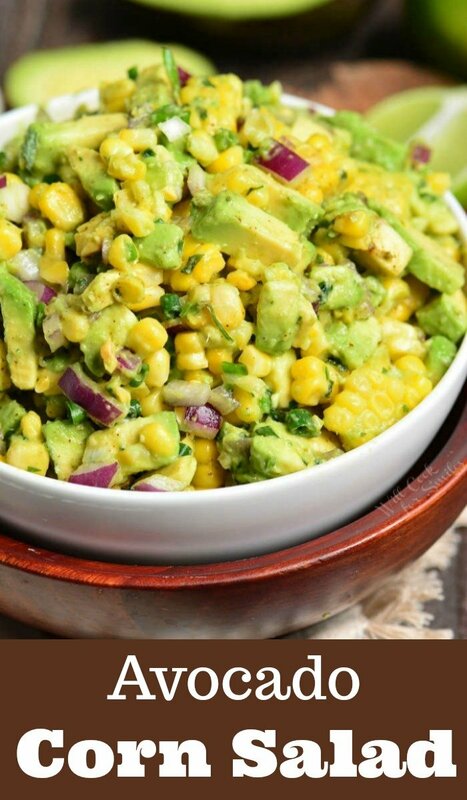 This combination of corn salad and avocado salad is amazing and not just because of the flavors. 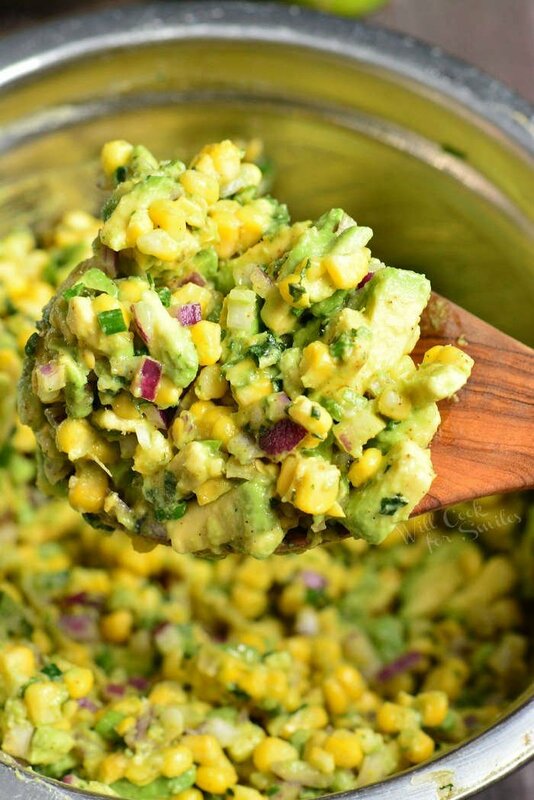 Adding ripe avocado to the corn salad makes it nice and creamy without having to add any mayo or sour cream at all. The simple combination of a few ingredients is really what makes this salad great. No need for a long list of ingredients because each addition here gives it a new layer of flavor and texture. 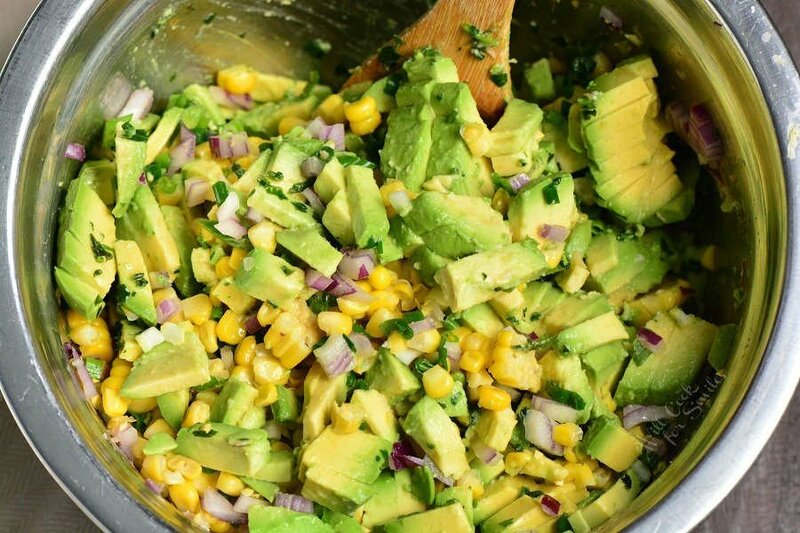 Avocado and corn are both complimented very well by lime, cilantro, onions, and chili powder. I was all ready to add some more spices and veggies but once I tasted this simple corn salad, it didn’t need anything else. Most of the time, simple truly is the best! Cook corn on the cob either on the grill on in the pot of water until fully done. TIP: To save a little time, corn can be cooked ahead of time and kept in the refrigerator, in an air-tight container. To cut corn kernels off the cob, stand corn up in a large mixing bowl cut side down. Slice the kernels off with a sharp knife from top to bottom, close to the part where kernels attach to the cob. Turn the ear of corn and repeat slicing the kernels off all the way around. Dice red onion and scallions and add it to the pot as well. Mince cilantro and mix it in with the corn and onions, adding salt and chili powder. TIP: Add avocado to the salad last so that it doesn’t get completely mashed while mixing. Cut each avocado in half and take out the pits. Peel avocado skin off and dice the meat into cubes. Add diced avocado to the mixed veggies in the bowl. Squeeze lime juice all over the avocado and add oil. Gently mix in avocado until just evenly incorporated. Heat up a large pot of water over medium-high heat and season it generously with salt. Make sure to take off the husk and all the silk threads from the ears of corn before cooking. Once water starts to boil, lower the heat to medium-low and add corn. Cover the pot and let corn cook for about 10 minutes, until tender. Take all the corn out onto a cutting board and let it cool enough to be handled. Cut the corn kernel off the cobs and add it to the mixing bowl. Prepare your charcoal until it’s ashed over. Move it to one half of the grill so that you have a cooler grill side and a hotter grill side. Make sure the grate is clean. Snip the silk whiskers sticking out of the top of the corn husk but leave the rest of the corn in a husk. Lay it on the grill, with the bottom of the husk towards the cooler side of the grill. Close the grill and cook for 13-15 minutes, turning it every 3-4 minutes. Take corn off the grill and carefully, using tongues, take off the husk and the silk. Brush corn with melted butter and place back on the grill. Close the grill and cook, turning it every 3-4 minutes, until lightly charred on all sides. Take corn off the grill and let it cool until it can be handled. Cut the corn kernel off the cobs and add it to the mixing bowl. 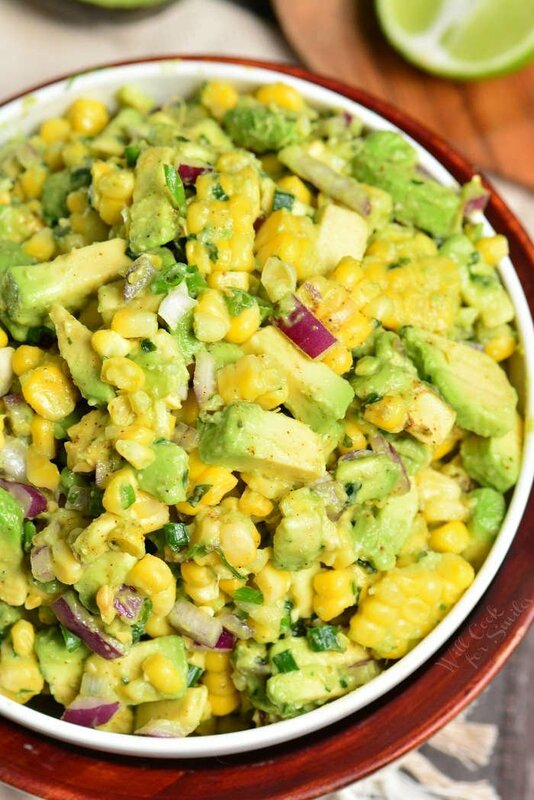 CAN AVOCADO CORN SALAD BE MADE AHEAD? Yes and no. 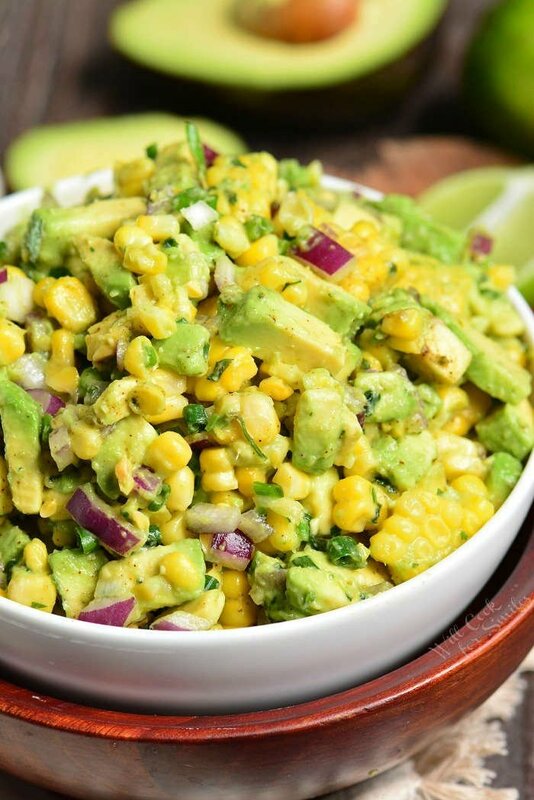 I do not recommend making the whole avocado corn salad completely ahead of time, but there are a few things you can do to save time and make it ahead. Corn can be cooked ahead of time and stored in an air-tight container in the refrigerator until you’re ready to make a salad. You can also prepare most of the salad ahead time. Just do not cut and add avocado until ready to serve. Prepare corn and mix it with onion, scallions, cilantro, and seasoning. Add oil and mix it together. Transfer salad into an air-tight container and refrigerate for up to 24 hours. When you’re ready to serve the salad, peel and cut ripe avocados and add it to the prepped salad. Squeeze lime juice all over the avocados and gently mix the salad together until avocado is evenly incorporated. 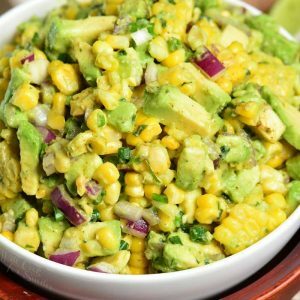 This avocado salad and corn salad fusion is made with simple combination of ingredients and it's so flavorful. Take all the corn out onto a cutting board and let it cool enough to be handled. Take corn off the grill and let it cool until it can be handled. Mince cilantro and mix it in with the corn and onions. Add salt and chili powder. My kids do not eat avocado, I hope to make a salad and then give it to them will result in the eating it. Thanks for this.